With the weather turning warmer and spring buds popping all around, our minds turn towards summer vacations and lazy days in the sun. We are happy to forget the harsh weather from this past winter. As any farmer will tell you, harvest is what happens in the vineyard year round. Though winter may be gone, it’s not forgotten. With each unique vintage, the wines are influenced by many things, and the biggest of those is the whims of Mother Nature. After a mild December, Michigan experienced extreme cold events in January 2019. These “Polar Vortex” events existed when a mass of frigid polar air plunged southward bringing very cold temperatures. Here in the Lake Michigan Shore AVA, a low-pressure system and winter storm passed through and brought a severe cold snap with temperatures dipping between -10 F to -15 F for over six days. These temperatures are simply too cold for many of the tender European vinifera vines (vines like Chardonnay, Cabernet Franc, Pinot Gris) to survive without some major damage. Site selection is a crucial factor in successful vineyard production, and our Mountain Road Estate Vineyard continues to fair well, even during these harsh conditions. Located at one of the highest points in the Lake Michigan Shore AVA, this vineyard’s elevation and slope help protect the vines from extreme weather. Vine assessment in April found that there was damage to the European vinifera grown there, but it was not as bad as expected. With adjusted pruning (and fingers crossed- no spring frost damage), we should have close to a normal crop of Sauvignon Blanc, Pinot Noir, Riesling and Cabernet Sauvignon at Mountain Road. These extreme temperatures also highlight the importance of growing different types of grape vines. Thankfully, we have many growers who have planted hybrid grapes that are cold hardy, like Chambourcin, Vidal Blanc, Traminette and Chancellor. These varieties are looking great so far this spring. Also, grapes that are native to the region are better able to tolerate extreme temperatures, so we expect to have plenty of Concord, Niagara, and Catawba. St. Julian is committed to using Pure Michigan fruit, which although challenging at times, continues to keep us experimenting and innovating. We are always planning ahead and can maximize our local resources by continuing to plant more and more vineyards, and our growers are highly skilled at producing the best fruit possible. Through the use of the latest technological advances and sustainable practices in the industry, we can continue creating high-quality Michigan wine, even under the toughest conditions. That being said, we are really happy to say goodbye to this past winter, and hello to the beautiful buds of spring. Oh how we love our rosé wine! While we think every season is rosé season, there is something about the weather turning warmer and the sun shining brighter that makes us gravitate towards these light and fruity wines. The 2018 SJ Chambourcin Rosé is made in the Saignée (pronounced sohn-yay) style. Saignée means “to bleed” and describes a method of rosé making where a portion of the juice is bled off the grape skins after a short amount of time. All grape juice is white in color. 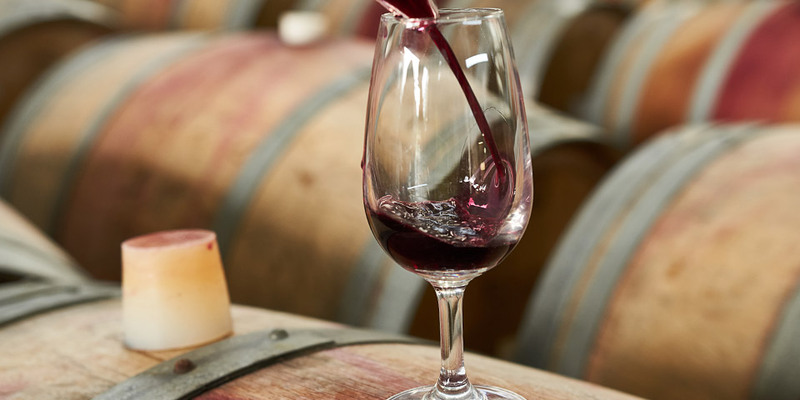 The color of the wine comes from contact with the skins after the grapes are crushed. The shorter the contact with the skins, the lighter the color. For this Chambourcin Rosé, the juice was in contact with the beautiful red grape skins for only one hour, giving it a beautiful translucent color. Chambourcin grapes have a high amount of pigment in their skins, so even with such short skin to juice contact time, the color extracted is stunning. The rosé juice was then fermented into wine and aged in stainless steel. This created an easy drinking wine that is light on the palate with bright, crisp flavors. Bursting with aromas of freshly picked cherries, this rosé has fresh fruit flavors of strawberry and raspberry. Rosé wines are in general, very food friendly. Almost anything you have at your summer picnic or BBQ will taste delicious with this wine. Enjoy it best chilled or frozen with a splash of lemonade. At 0.1% Residual Sugar, this refreshing wine is simply “ joy” in a glass. Cheers to warmer days and patio parties with the new Chambourcin Rosé. As we like to say; seize the day, then sip rosé! At St. Julian, we love creating delicious new wines for our sweet drinkers, like this brand new blend featuring Cherry wine and Sweet Riesling. St. Julian has a long history of producing award-winning Cherry and Riesling wines; so creating a new wine out of these two fruits was a perfect way to honor and celebrate May, which is Michigan Wine Month. The Cherry wine in this blend was created from Montmorency, Meteor and Balleton cherries sourced from Oxley Farms in Lawton; just 3 miles from the winery. The combination of sweetness and tartness is a true showcase of Michigan’s most abundant fruit. St. Julian’s Cherry Wine is known for its intense cherry pie flavors, subtle earthiness and a touch of spice, which you will find in this wine. Riesling grapes continue to be the state’s calling card when it comes to top quality European varietals. For this wine, Riesling grapes were sourced from the Nitz vineyards in Baroda. The warm sunny days and cool evening tempertures of the Lake Michigan Shore Appellation create ideal conditions to build intense sweet tropical flavors balanced by the perfect amount of acidity. Pair these two Michigan rockstars together and you have the perfect summertime wine. St. Julian’s Cherry Riesling captures the Riesling’s delicate tropical fruit sweetness and refreshing acidity and mingles it with the Cherry’s complex fruity flavors. Perfect served alongside your warm weather BBQ, this will be your new go-to summer easy drinking wine!